It has been a while. There were days in which I asked myself if I was ready to return. There were moments that I wondered if there was anything worth sharing. Was there going to be value, growth and purpose to the words I would put on blank pages? Writing had been put on hold. I had lost my drive to grow through written reflection. And in this moment I realized something as profound as any moment in my career. The reality was that I had not in fact lost my drive, rather I was seeking to grow. And for me, that meant I needed to listen, more. We are each consumed with our work and our passion for teaching and leading. Days are full of supporting those we spend countless hours with. Time passes by as we give ourselves to our community of learners. Our actions consume us as we constantly strive to improve all that we do. 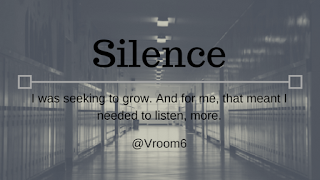 In an unsuspecting moment, through the guidance of others, I was reminded of the need to come back to center, to listen more and to grow in this leadership journey. Through this lesson of silence there was a revelation that I did not expect to come face-to-face with. This silence reconnected to me the drive that I had either suppressed or become distant with. The silence became powerful. I began to feel more grounded than I had in quite some time. I found myself recommitted to my tribe both near and far. The journey of teaching and leading and the purpose of both gained depth. Relationships around me strengthened. In the silence I grew. This unplanned, unimagined silence has inspired me to come back to the pages that have been blank for far to long. Reflection is essential. Sometimes it is sharing our journey and other times it is simply listening to the silence that is around us. And with that, the silence subsides. Slowly. Intentionally. Purposefully. 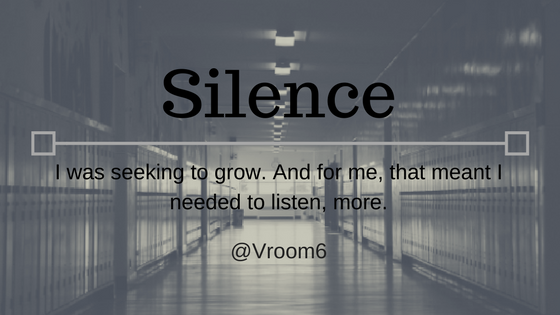 Silence is an important aspect of meditation and in Quaker circles. Silence allows us to listen to others, ourselves and the world around us, which allows us to return to ourselves. I hope your path leads you to where you want to go. Good luck!